Most of us don’t even notice we're breathing; we just do it 17,000 times a day without thinking. As a lung doctor, I work with people who face a constant battle to breathe and, for many of them, failure of their lungs will lead to premature death. We treat these people as best as we can, but my research goal is to reduce the burden of lung disease as much as possible. One of the main problems in lung disease research is the fact that it's dangerous to take a part of the lung to study, so it is hard to understand how lung disease occurs and progresses. One of my current focuses is on building a biobank of lung tissue from a variety of patients, which can be used by lung researchers both locally, nationally, and internationally to work towards helping people with breathlessness and lung diseases. More specifically my research is focused on how the lungs scar. In several lung diseases, including asthma and pulmonary fibrosis, the lung scars and thickens. This stops the lungs expanding and contracting with every breath as they should, leading to shortness of breath, disability and unfortunately early death from lung disease. I am trying to understand why the thickening and scarring happens, and how we can stop and reverse it. It is heartbreaking seeing people struggling with their breathing, when in many cases we can do little about helping them. This led me to combine being a lung doctor with being a lung researcher to better understand, treat and ideally prevent lung disease in the future. The ultimate goal for my research would be to understand and prevent lung disease, so that people won't be prevented from walking to the shops, playing with their children or working because of their breathing. On the way to this ultimate aim, I want to improve the lives of people with lung disease, by understanding how their disease occurs, treating it better and stopping it from worsening. 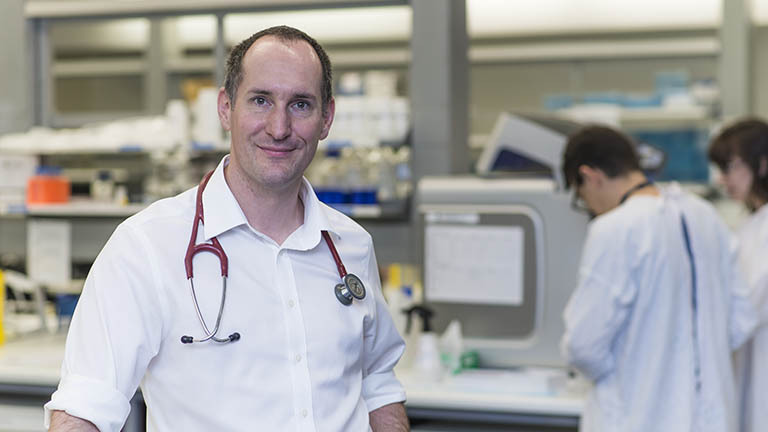 Associate Professor Chris Grainge is a respiratory physician and clinician scientist whose work focuses on understanding the interaction between the physical environment and the lung, and how this interaction leads to lung disease. The patients who Dr Grainge sees in his lung clinics often cannot do activities that most people would consider ‘normal’, like walking round the supermarket or climbing stairs. This lung failure is often because the epithelial cells and fibroblast communication breaks down and the lung either becomes dangerously stiff, or doesn’t repair itself properly following a minor insult like a viral infection. In order to understand how the epithelial cells and fibroblasts work together, and how this collaboration becomes upset, Dr Grainge and his team use elaborate models of lungs and their diseases in the laboratory to mimic the conditions in the lung in health and disease. These models involve cells from patients with lung disease being grown and manipulated while being infected with virus, stretched and compressed and treated with current and future drugs. One of the problems with lung research is that researchers including Dr Grainge struggle with, is that access to lung tissue to work with and use to understand lung disease is very difficult. In order to try and improve this situation he is working to establish a large biobank of lung tissue which can be used by researchers throughout the country and the world to investigate the causes and treatments for lung disease. My future focus as a lung researcher is in two parts. The first is to build a large biobank of lung tissue, as mentioned. The second is to continue to work on how the lung responds to common stimuli, such as infection, stretch and pollution. As a lung doctor, seeing patients daily, my focus has always been and will remain on trying to help treat their lung disease as best as possible, allowing them to keep their focus on their lives, family and dreams, not on their breathing. Bronchoconstriction is a cardinal feature of asthma, generating mechanical stresses within the airways including cell compression and increased shear stress due to increased air-flow. My research examines the causes and consequences of asthma attacks. As recent events in Melbourne have shown, severe attacks of asthma still kill in Australia and my aim is to understand what happens during these attacks, and treat them better. We will investigate how airway narrowing that happens during an asthma attack not only leads to worse asthma symptoms and in some circumstances death, but also has other effects. Current therapies prevent only ~40% of asthma exacerbations. These figures are in the context of clinical trials - real life asthma exacerbations are even less likely to be prevented.